International Leonid Watch - Homepage. Several maxima were observed during the 2000 encounter with the Leonid shower, each of which can be identified with the passages of individual dust trails of comet 55P/Tempel-Tuttle. This result confirms the meteor models that predict strong activity in 2001 and 2002. Left: Michael Boschat in Halifax, Nova Scotia, Canada, obtained this very nice Leonid picture in a remarkable part of the sky on November 17/18, 2000 at 0850 UT. Other pictures: check NASA HQ's Near-Live Leonid Watching System. 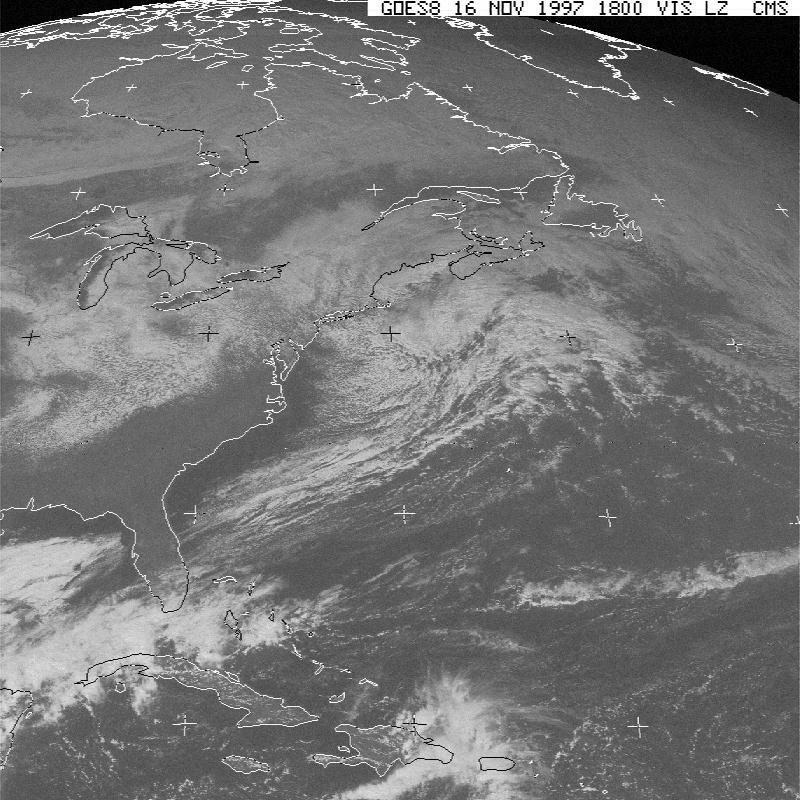 NASA/HQ reports: "The Leonids continued to be the top story. 40 stations carried Leonids images and discussed NASA research on 11/18/99. Congratulations to Ames and Marshall for their fine work." The figure left shows Leonid counts by Koen Miskotte of the Dutch Meteor Society . He participated in the ground campaign in support of Leonid MAC that was organised by DMS in Spain and Portugal. Three two-station networks were set up. Other results are reported here , which also lists results from the Leonid MAC related ground-based campaign in California, where a two-station photographic network was established. Quote: "Wow....I think we are all green with envy at the spectacular show you saw. Congratulations on some GREAT observing - Jeremy." 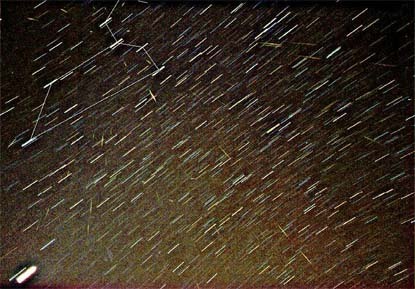 Photo: More than 70 Leonid meteors in a 10 min. exposure by Eyad Mustafa from the Al Azraq desert camp in Jordan around maximum time of the 1999 Leonid storm. 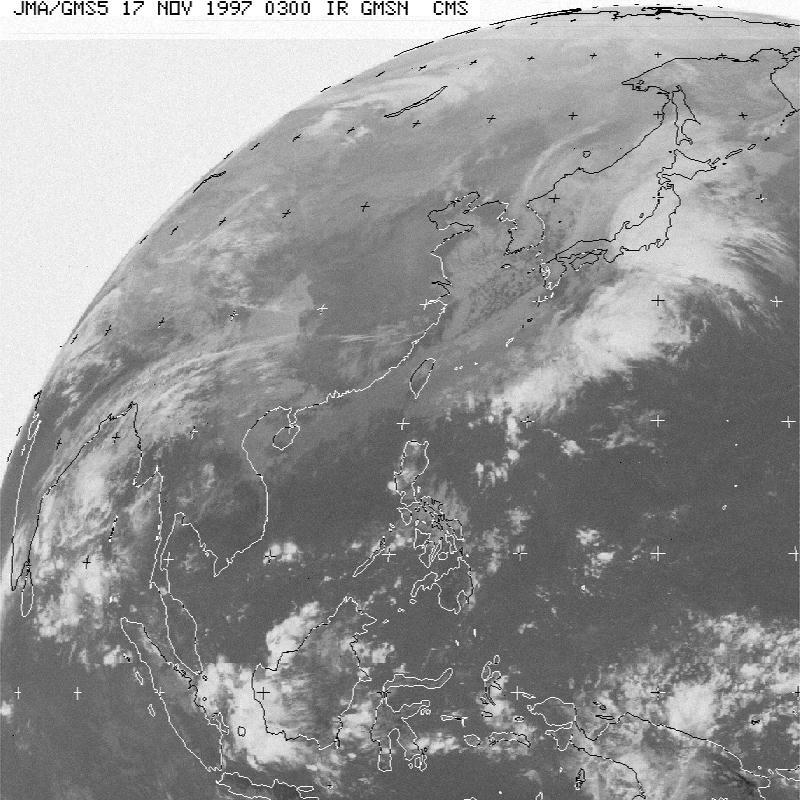 Images of the 1999 Leonid storm taken during the Leonid Multi-Instrument Aircraft Campaign are found here. Other images are found at the Near-live Leonid Watching System. Figure left: Routine 4-hour exposure all-sky picture from the European Fireball Network station in Modra, Slovakia, showing numerous Leonid fireballs. 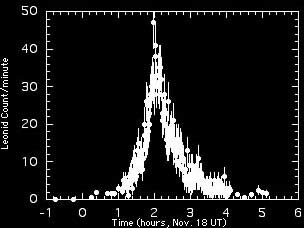 The image was guided on the stars and taken on16/17 Nov 1998 between 23:30:00 and 3:37:10 UT. On the negative are counted 156 meteors brighter than -2 mag. Unfortunately, it was clouded at Ondrejov Observatory and other EN stations, reports Jiri Borovicka who participated in Leonid MAC. Photo courtesy: Tomas Paulech & Juraj Toth, Astronomical Institute of the Faculty of Mathematics and Physics of the Comenius University, Bratislava, Slovakia - Astronomical observatory at Modra - and EN leader Pavel Spurny, Ondrejov Observatory. Nov. 16/17:Manilla, Phillipines, South Korea, Russia, Thailand. 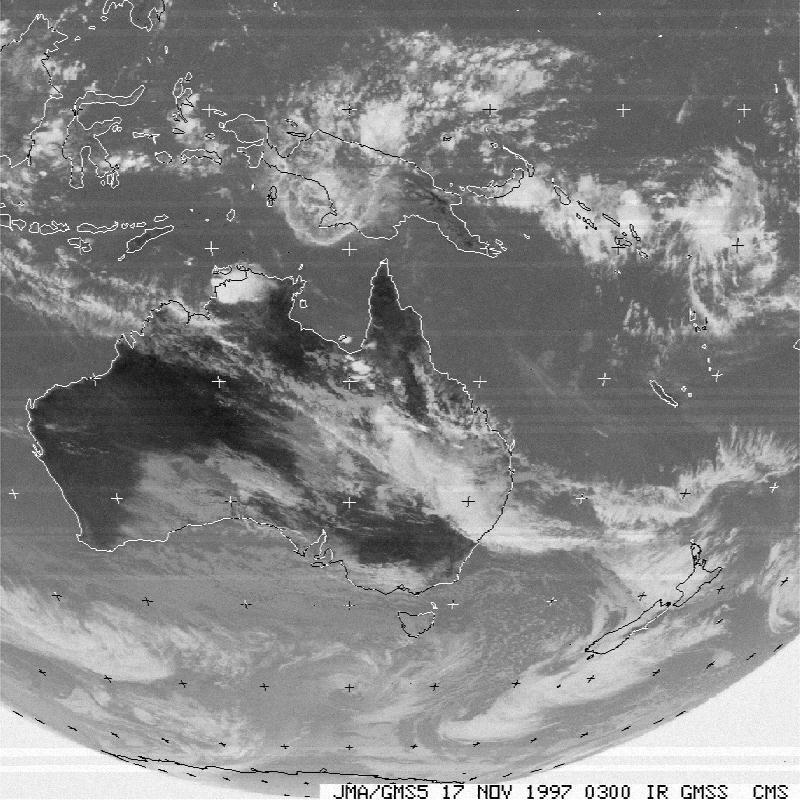 General: China, Perth in clouds, east coast. Nov. 16/17: From aircraft over atlantic, U.K. (no faint meteors! 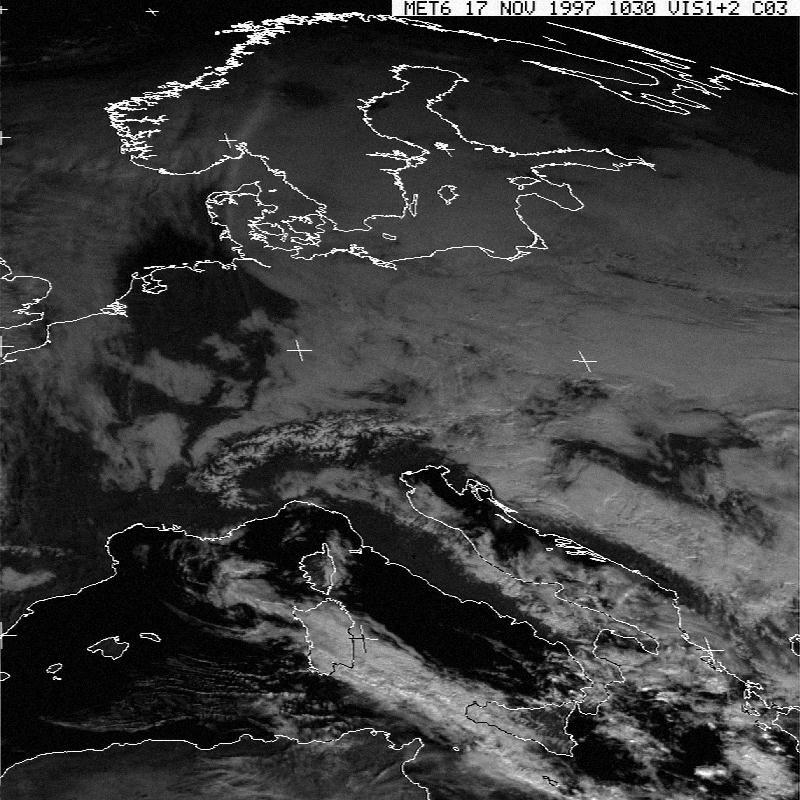 ), U.K., U.K., Netherlands (radio), Portugal, Canary Islands, Spain, U.K., Belgium, La Palma, Canary Islands (1000-2000/hr!, but...), Turkey, Slovenia?. Nov. 16/17: New Mexico, Illinois, NewJersey, California, California, Oklahoma, Florida, Florida, Maryland. Brasil, California, California (Bay Area), California. Nov. 17/18: Japan, Korea, Thailand, Malaysia, Singapore, radar Australia, visual Australia, New Zealand. Nov. 17/18: Portugal, Belgium, Jordania, Tenerife, Spain, Norway. Nov. 17/18: Maryland, Georgia, New York, Ontario, Canada, South Carolina, Massachusetts, Brasil. 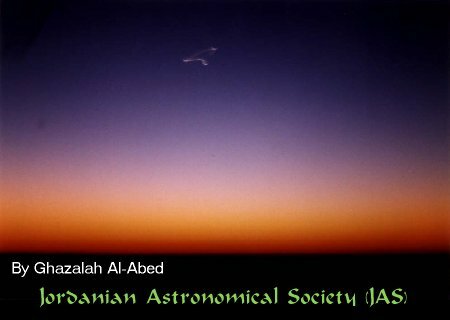 Meteor train in morning twilight from Jordanian Astronomical Society (JAS). The night Nov. 16/17: the Netherlands, Germany, radio Netherlands, Italy, Canary Islands, Northern Italy, radio Netherlands. The night Nov. 17/18: the Netherlands. Arkansas, East coast, Eastcoast, Hawaii, Illinois, Houston, California, California, East coast, radio Florida, radio Florida, island east coast, Arizona, radio Canada. Univ. of Illinois, FISBAT-CNR, Inst. of Atmospheric Physics,Kuehlungsborn, Germany , Edwards AFB radar, Edwards AFB photography, Edwards AFB photography. IAU Circular, M. Langbroek, DMS, R. Arlt, IMO. 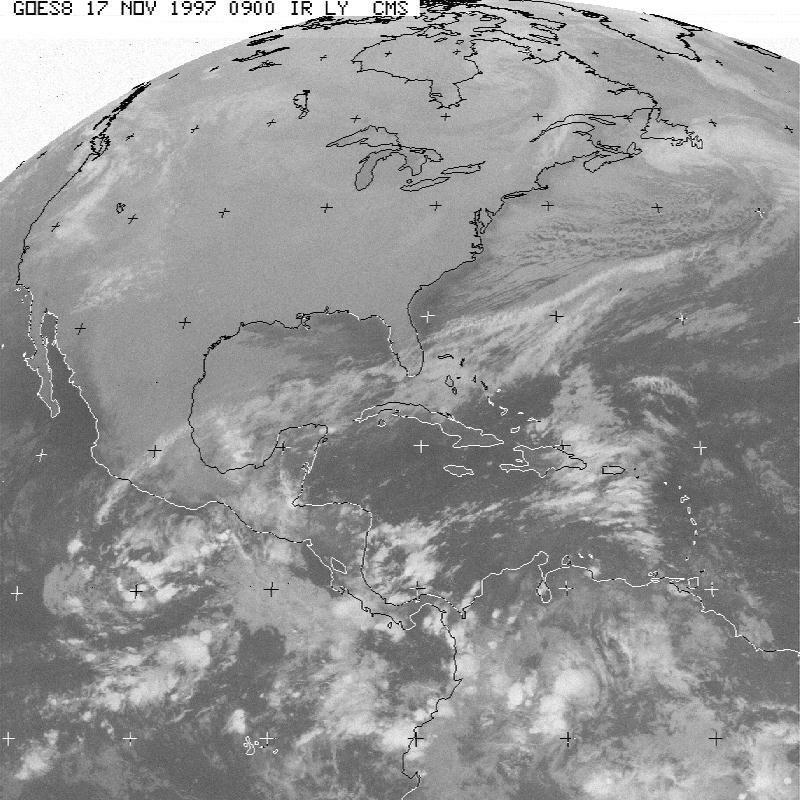 The Leonids returned much as expected in 1996. Many people were clouded out. That was unfortunate, because the shower was as strong as a return of the Perseids, with an excess of bright meteors. The rates of the showerstill follow closely the behavior of the 1960's. 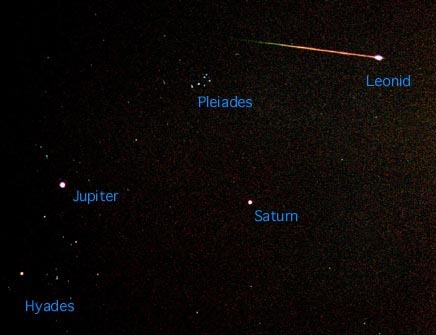 The 1995 Leonids were observed from California and Europe (Spain) simultaneously by members of the Dutch Meteor Society. The shower peaked over Europe close to the node of the comet orbit. This was earlier than expected. The rates were less than in 1994, following a similar pattern than in the 1960's. A strong shower surprised Peter Jenniskens in the early morning of November 18. After an unsuccesful observing campaign in the previous night, spoiled by cloud and rain shortly after the radiant rose above the horizon, suddenly there was the strong shower that was first detected in 1961, some 4 years prior to the return of the comet. The pattern repeated this year, except that the shower was a day late. Other fortunate observers to withness this first of the Leonid outbursts included Josep Trigo in Spain and radio observer Ilkka Yrjola in Finland. April 10-14, 2000 - IAU Colloguium 181 "Dust in the Solar System and other Planetary Systems", University of Kent at Canterbury, UK. Contact: M. L. Watts.
. Contact: Charles B. Agee and David C. Black. April 12-15, 1999 - Leonid MAC Workshop NASA Ames Research Center, CA. Contact: Peter Jenniskens. May 11-13, 1999 - '99 Leonid Meteoroid Storm and Satellite Threat Conference, Manhattan Beach, CA. Contact: David Lynch. 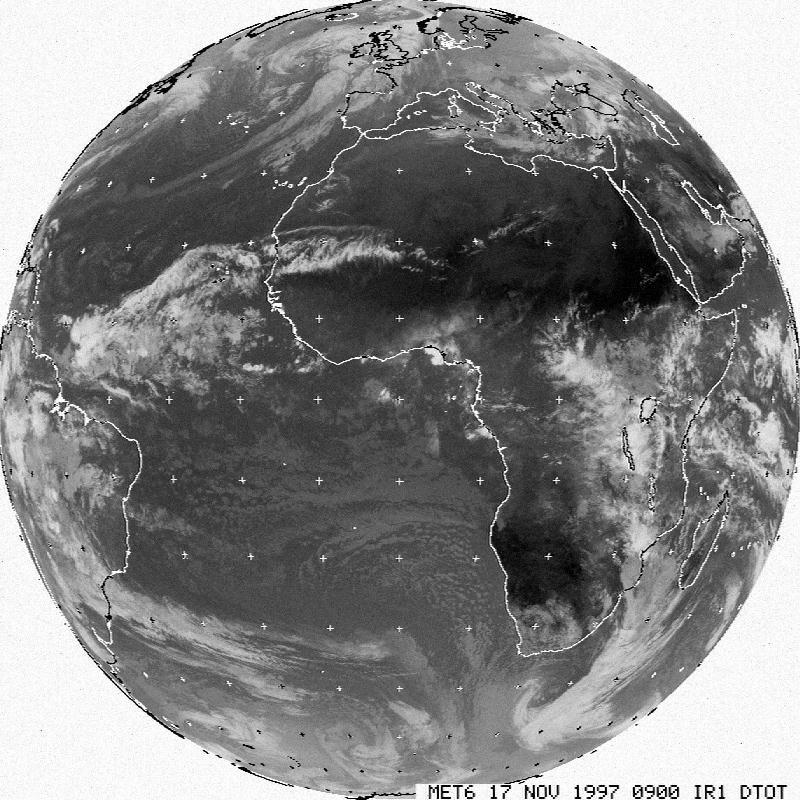 April 27-28, 1998 - Meteoroid Strom and Satellite Threat Conference, Manhattan Beach, CA. Contact: David Lynch. April 29, 1998 - Leonid MAC working meeting, Manhattan Beach, CA. Contact: Peter Jenniskens. spring 1998 - AGU Spring meeting, special session. Contact: Mike Mendillo.